View this informative booklet detailing the construction of the Ark with spectacular photographs and helpful text (PDF). The Cross is the greatest reminder for us of the salvation we can have in Jesus Christ. The Creation Museum was built as a reminder that we can trust the authority of God’s Word in every area. Other than the Cross, the Ark of Noah is one of the greatest reminders we have of salvation. The Ark Encounter project was born out of a desire to share the gospel of Jesus Christ to millions of people across America and the world. This project has been years in the making. See how the Lord has worked mightily over the years to make this project a reality. Looking Ahead: What’s Coming in 2019? We’re Hiring at the Ark Encounter! Meet Artist Oscar Nava at Día Latino! Is There Evidence of the Flood? Can We Trust the New Testament Manuscripts? Everything Fit Inside the Ark? Who Visited the Ark Encounter in 2017? There’s Still Time to Encounter the Wonder! Look How ChristmasTime Transformed the Ark! Merry Christmas from the Ark Encounter! Ark Survival 101: Would the Ship Sink or Swim? Spend the Weekend in Kentucky! Concerts, Ark Tickets, and Kentucky Attractions, Oh My! Can You Find These 11 Details in the Exhibits? Meet the Ararat Ridge Zoo Kangaroos! Why Should You Visit the Ark This Winter? What’s New at the Ark Encounter? How Can You Learn More About Noah? Who Has Visited the Ark Encounter? How Could Noah’s Family Have Survived the Journey? Why Should You Ride the Zip Lines in the Fall? Does the Bible Really Say...? What Fossils Will You Find? Where Have Ark Encounter Guests Traveled From? Why Work at the Ark Encounter? How Did We Make the Lettuce and Cabbage Garden? Enter the Ark Encounter Countdown Giveaway Today! What Will You Encounter in the Ark Queue Line? What Kind of Jewelry Did Noah’s Family Wear? Win a Three-Year Boarding Pass to Ark Encounter! Now Hiring for Ark Encounter! Admission to Ark Encounter for Life? Where Are the Ark and Museum Advertisement Buses Going? Big Logs, Big Project, Big Vision! Ark Encounter Now Looks Like an Ark! What Will You Experience at the Ark When You Visit? The Ark Looks Like an Ark! What Did Noah’s Language Look Like? 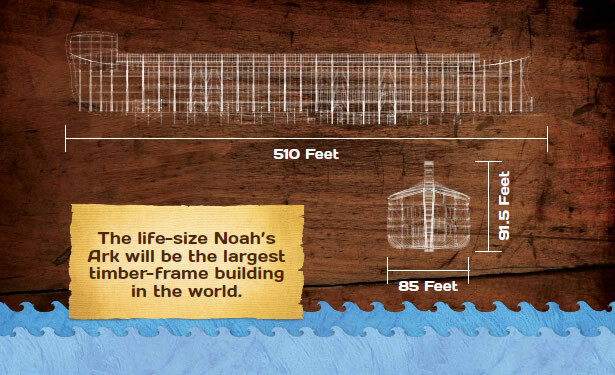 Why Include a Keel on the Ark Encounter? What Is a Fairy-tale Ark and Why Is It Dangerous? The Voyage Begins Again on July 7! New Buses or Re-Manufactured Buses? What Is Fair Trade, and Should You Care? Meanwhile, Back at the Ark Design Studio . . . When It Doesn’t Rain, We Pour! Ark Encounter in the Headlines Again! Noah and the Animals—Part 4: Why Would He Bring Dinosaurs? Noah and the Animals—Part 3: Seven or Fourteen? Noah and the Animals—Part 2: How Did Noah Find the Animals? Noah and the Animals—Part 1: How Could Noah Fit all the Animals on the Ark? Genuine Ark, Part 5: Building on Land or Water? Has Noah’s Ark Already Been Discovered? Genuine Ark, Part 1: How Can Your Ark Be a Replica? How Long for Noah to Build the Ark? Eight People to Build the Ark? Win a DVD/Book Combo Pack! Was Noah's Ark the Biggest Ship Ever Built? Did We Strike a Chord (Or a Nerve)?